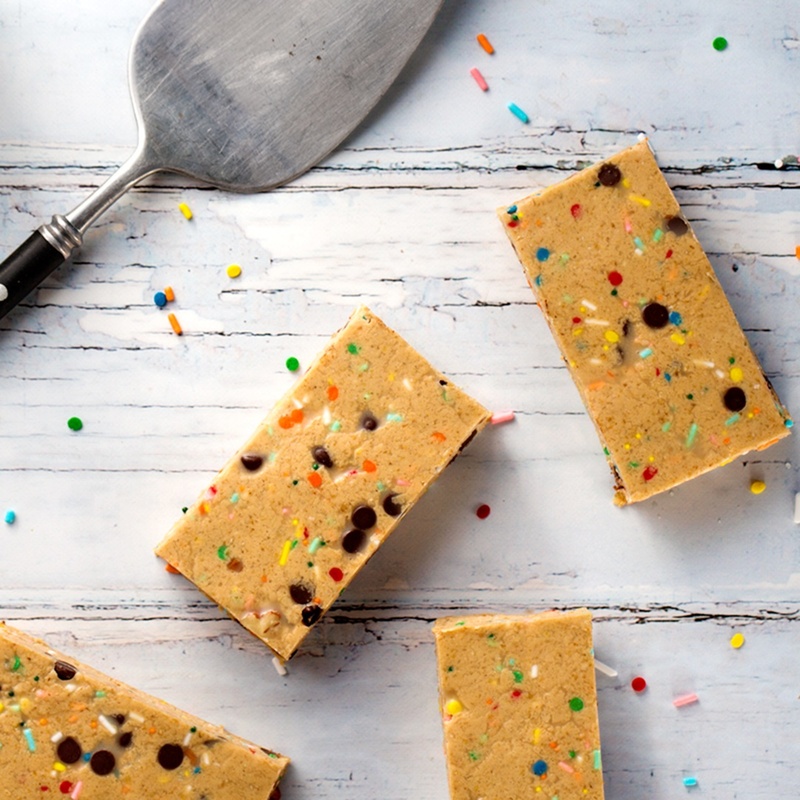 They may taste like a treat, but these soft, chewy, breakfast-worthy protein bars are filled with nutritious goodies. Line an 8x4-inch loaf pan with aluminum foil and lightly grease it. In the bowl of your stand mixer*, combine the oat flour, protein powder, and salt. Separately, mix together the cashew butter, melted coconut oil, agave, and vanilla before adding the whole concoction into the bowl of dry goods. Begin to mix slowly to incorporate. After about a minute of mixing, add the sprinkles, nuts, and/or chocolate, in any proportion your heart desires, as long as it's no more than ½ cup in total. Once the batter is smooth and cohesive, transfer it to your prepared pan and smooth it down into an even layer. Place the pan in the freezer for at least 5 to 6 minutes, just until the bars are firm enough to cut. Use the foil like a sling to pull the bars out, and slice into individual servings. Store in an air-tight container or wrapped in plastic in the refrigerator. *You can mix everything by hand in a large bowl, but the batter is very thick and difficult to stir, so you'll need to put some serious muscle into it. Be prepared to ditch the spatula and use your hands towards the end!